The Pageant Blue review model (Autoart also has offered a pale yellow) is of the 1969 model that featured a 1.8-liter I4 engine and rode on a short 91-inch wheelbase. Ultimately, nearly 400,000 Mk. II models were built, starting in 1967. 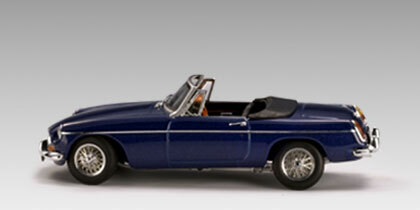 Befitting its $36 price, the Autoart model is well executed, but with no opening features, such as hood or doors. This is a car, like many 1:43 models, for collectors filling holes in their collection, or snagging something they just like and haven’t been able to find in any scale. This size also displays easily and you can fit a load more into any display area compared with 1:24 and 1:18 scale. 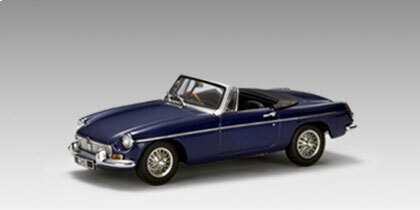 I like the price point and I like the fine exterior detail on the MGB. For instance you not only get a beautifully shaped body, but a thin chrome trim line down each side, chrome bumpers, grille and door handles. Likewise the window frame and small vent windows feature chrome-look edging. Headlights and taillights look realistic and there are dual chrome wipers on the windshield. An MG logo is just above the chrome key hole on the trunk lid and the car features wire wheels to cement its sports car look. The interior features black bucket seats, but no seat belts, and a small shifter and emergency brake lever. The steering wheel is wood-colored and the dash well detailed for this scale with the usual dash gauges, radio and buttons along with a well-defined glove box. This one is created with the roof down and a black boot on the back, giving it a sporty top-down profile. Other pluses, the front wheels can be turned and posed if you want to take it out of its plastic display case, and the bottom is finished with a tailpipe and muffler too. 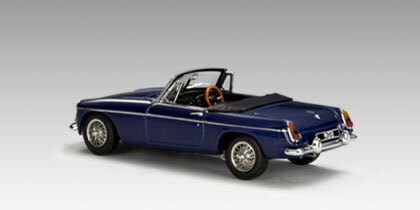 Autoart’s MGB is a good value and a sporty model that displays well.